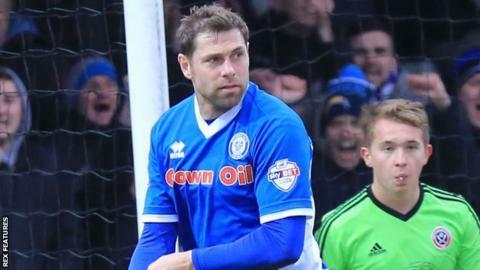 Grant Holt scored his first goal since rejoining Rochdale to help beat Sheffield United in League One. Rochdale goalkeeper Josh Lilis pulled off a string of excellent saves from Florent Cuvelier and Che Adams to stop the Blades taking the lead. Dale broke the deadlock when Holt flicked on to fellow substitute Peter Vincenti, who curled past Lilis. Holt then swept Michael Rose's corner into the roof of the net to secure the victory for Rochdale. "Holty's come in and he's done exceptionally well in training and he's done well in the games when he's come on. "If you want a promotion winning team, you've got to have game management, game knowledge and players who can go out there and do it without being coached. "There's a lot of things to be said about the politics of football, the fact of the matter is, we've won 12 games and I'm pleased about that." Match ends, Rochdale 2, Sheffield United 0. Second Half ends, Rochdale 2, Sheffield United 0. Foul by Niall Canavan (Rochdale). Stefan Scougall (Sheffield United) wins a free kick on the right wing. Corner, Rochdale. Conceded by Stefan Scougall. Michael Rose (Rochdale) wins a free kick on the right wing. Foul by Stefan Scougall (Sheffield United). Corner, Rochdale. Conceded by Matt Done. Substitution, Rochdale. Rhys Bennett replaces Matthew Lund. Attempt missed. Matthew Lund (Rochdale) right footed shot from outside the box misses to the right. Joseph Rafferty (Rochdale) wins a free kick on the right wing. Foul by Matt Done (Sheffield United). Goal! Rochdale 2, Sheffield United 0. Grant Holt (Rochdale) right footed shot from the centre of the box to the top left corner. Assisted by Michael Rose with a cross following a corner. Corner, Sheffield United. Conceded by Niall Canavan. Joseph Rafferty (Rochdale) wins a free kick in the defensive half. Substitution, Sheffield United. Stefan Scougall replaces Ryan Flynn. Substitution, Sheffield United. Paul Coutts replaces Florent Cuvelier. Attempt missed. Matthew Lund (Rochdale) right footed shot from outside the box is close, but misses to the left. Corner, Sheffield United. Conceded by Josh Lillis. Attempt saved. Che Adams (Sheffield United) right footed shot from the centre of the box is saved in the centre of the goal. Goal! Rochdale 1, Sheffield United 0. Peter Vincenti (Rochdale) right footed shot from outside the box to the bottom right corner. Assisted by Grant Holt. Matt Done (Sheffield United) wins a free kick on the right wing. Corner, Sheffield United. Conceded by Peter Vincenti. Foul by Che Adams (Sheffield United). Attempt missed. Niall Canavan (Rochdale) header from a difficult angle on the right misses to the right. Corner, Rochdale. Conceded by John Brayford. Peter Vincenti (Rochdale) is shown the yellow card for a bad foul. Chris Basham (Sheffield United) wins a free kick in the attacking half. Attempt missed. Michael Rose (Rochdale) left footed shot from outside the box is close, but misses to the left. Hand ball by Florent Cuvelier (Sheffield United). Attempt missed. Chris Basham (Sheffield United) right footed shot from the centre of the box is too high. Corner, Sheffield United. Conceded by Michael Rose.